Raised in Cleveland, Ohio Aldo starts working for his father during the summer in the family’s cement construction business at age 9. First sang in front of an audience at 10 years old when he tried out for a school talent show. Was stopped half way through the song and told he wasn't good enough. At the age of 14 Aldo tried out for the school choir and was stopped during the audition and told by the teacher he “didn't fit in with his kind of singing” and suggested he choose another class. At 18, Aldo attended a local carnival where a band was prompting audience members to come up on stage to sing. After encouragement from his friends he took the stage and thrilled the audience. This would become one of many key events that would change his life forever as he watched the cheering, dancing and smiling crowd in front of him begin to quickly grow larger. Through the next three years he would join several bands, performing at private parties and for family and friends until beginning his professional music career. From this point on he would form bands marketing his own name, building a huge following throughout Northeast Ohio, and molding the sound and style while mixing his influences; Little Richard, Bruce Springsteen, Elvis Presley, Roy Orbison, Jerry Lee Lewis, Marty Stuart, Alabama, John Cafferty, Bob Seger, and the soul of true southern gospel music that would inspire later recordings. October, 1989 With his father announcing his retirement and the well established construction company would now be his, Aldo announces he’s no longer interested in taking over. Opting instead to gamble on a dream. 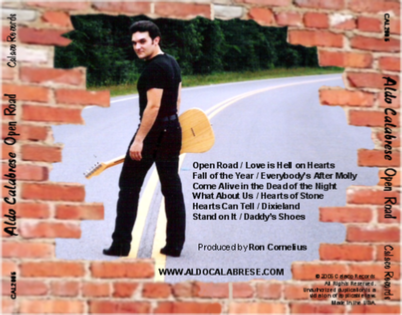 May, 1995 Six years after beginning his professional career and by the request of his fan base, Aldo releases his first studio album to promote around Northern Ohio and Western Pennsylvania. The album is titles Pledging My Love. April, 1996 Aldo performs at the Grand Ole Opry in Nashville. August, 1997 Aldo is back in Nashville for the first of many sessions through the next 18 months to begin recording his second, self titled studio album. Believing it would be a great follow up after his first release to market to his local audience and having no idea what this album would become. Sept. 28, 1998 Aldo's First Single, My Best Friend is released to radio stations throughout the United States, Europe, South America, Australia and New Zealand. Feb. 26, 1999 After a 23 week run on the Nashville Tracker Top 50 Independent Chart, My Best Friend became Aldo’s first #1 and peaked at #6 on the Indie Central Top 100 Chart. The song remained on both charts for a total of 25 weeks. Mar. 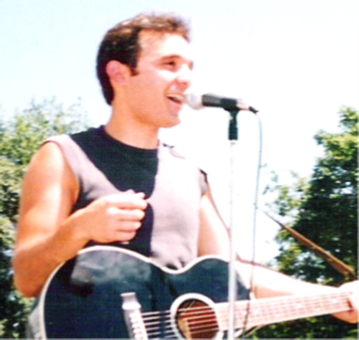 14, 1999 Aldo was nominated for New Country Male Vocalist and Male Rising Star at the Golden Music Awards in Nashville, TN. He performed Mess Around during the event. April 7, 1999 His album is released. July 9, 1999 After a 21 week run, Mess Around hit #1 on the Nashville Tracker Independent Chart and #7 on Indie Central Top 100 Chart. Aug. 9, 1999 The third single, Some Like It Hot is released to radio stations throughout the U.S., Europe, South America, Australia and New Zealand. of the Year, Male Vocalist and Rising Star. He performed Some Like It Hot at the event. Nashville Tracker Independent Chart and #3 on Indie Central. the award for Rockabilly/Country Artist of the Year. Sept. 8, 2000 After a 21 week run, Life's Bridges hit #1 on the Indie Tracker Chart. The song peaked at #16 on Indie World, #14 on Inside Country, and #24 on Indie Central before that chart closed in the second week of July. Oct. 20, 2000 The 2000 OCA was held in Laughlin, Nevada. Aldo again had several nominations including Album of the Year, Rising Star and Male Vocalist of the Year. He won the award again for Rockabilly/Country Artist of the Year. Nov. 20, 2000 The fifth Single, I'm On Fire is released to radio stations throughout the United States, Europe, South America, Australia and New Zealand. Mar. 31, 2001 After a 19 week run, I'm On Fire hit #1 on the Inside Country Chart where it sat for two weeks. The song peaked at #4 on Indie Tracker before the chart closed in the first week of March, and #15 on the Indie World chart. The song remained on the charts for a total of 22 weeks. June 16, 2001 The 7th annual, GMA Show was held in Nashville, TN. 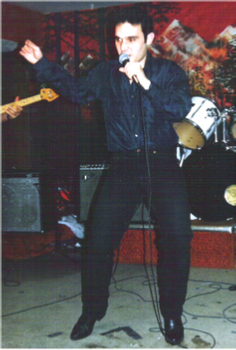 Aldo was nominated for Male Vocalist, Single of the Year for Life's Bridges, and Artist of the Year. Sept. 1, 2001 The sixth Single, King Of Country Rhythm & Blues, is released to radio stations throughout the United States, Europe, South America, Australia and New Zealand. Feb. 2, 2002 King Of Country Rhythm & Blues hit #1 on the Inside Country Chart, and peaked at #9 on the Indie World Chart. The song remained on Inside Country for a total of 27 weeks. June, 2003 Aldo begins recording his third studio album in Nashville, TN. The CD will be titled Open Road. March 1, 2004 Aldo is featured this month in the Artist Spotlight section of Countrystarsonline.com. June 13, 2004 Aldo appeared on the Music City Spotlight Show in Nashville for an interview and the performance of Everybody’s After Molly and Dixieland from his new album. The show aired on Comcast Channel 75 and was seen throughout the Middle TN viewing area. The new CD is released the following month. Feb. 1 & 6, 2005 The Nashville Onstage Television Show aired in Nashville TN on local network channel 19, featuring Aldo's performance of Dixieland and Daddy's Shoes from the new album. May 2, 2005 The first single and title track, Open Road is released to radio stations throughout the U.S., South America, Europe, Australia and New Zealand. Aug. 19 -Sept. 3, 2005 Open Road became his seventh #1 hit on Indie World Independent Chart, then the following week on the Inside Country Independent Chart where it remained for two consecutive weeks.